Over the past few years, most everyone has become accustomed to using and benefiting from the “hands-free, eyes free” value of voice technology. When driving, the Google Maps application on our smart phone, will voice direct our every turn to optimally get us from our current location to our desired destination - all while allowing our hands to be free to be on the steering wheel and our eyes to be free to be on the road ahead. More than 20 years ago, Vocollect pioneered the voice technology used to voice direct workers in picking and other distribution center workflows – long before Google Maps and smart phones were around. As a result, today, more than 500,000 workers worldwide use a Vocollect voice-directed picking solution each day. But, most of the order picking taking place in distribution centers today is still done using paper or RF scanning devices. Workers carry a paper list of items to be picked and their corresponding pick locations. They travel to the location, double check that they are at the correct location by looking again at the paper and the numbers on labeled bin or rack. They then look again at the list to read the quantity of items to be picked. After setting the paper down or tucking under their arm, they make the pick and place the item onto a pallet or cart or in a carton or tote. They then use a pencil to cross off the picked item from the list and continue on. When workers use an RF scanning device, the device’s screen becomes their electronic paper pick list. They use the device’s scanner to confirm their pick location and the device’s keys to confirm the quantity picked. But, the worker as when using paper, still needs to hold the device, read the information presented on its screen and they put it down or tuck it under their arm to make the pick. While wearable RF devices eliminate the latter, they still require workers to interact with the device’s screen and keyboard in ways similar to paper and pencil. Imagine how much more efficient your picking process would be if you assigned two people to each order. Worker # 1 would interact with the “RF scanning device” and tell worker # 2 where to go. Worker # 2 would confirm that they were in the correct location by reading “two check digits” on the label of the bin or rack to Worker # 1 who would verify that they were the correct check digits before then telling Worker # 2 how many items to pick. Worker # 2 would make the pick and verbally confirm the quantity picked to Worker # 1 who would then make a time stamped entry into the “RF scanning device”. You may be thinking that you have been picking orders the same way for years and don't really see the value in implementing a new system that will require an investment and a change. Fundamental to the value of making a change to voice is the total cost savings that result from improved worker productivity and accuracy along with the dramatically reduced training times for new and temporary employees. Productivity increase of at least 25%, accuracy rates of 99.9% and ROI / payback periods of less than 12 months are common. Voice-directed picking has proven to be up to 25% faster than traditional methods. An expert total voice solution provider will be able to quantify and deliver the value of voice for your specific operation. 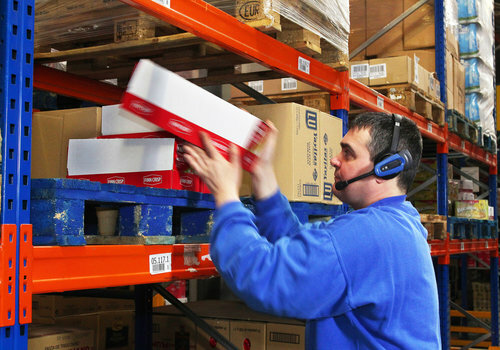 With a “hands-free, eyes-free” voice-directed work solution powered by Vocollect technology, your distribution center operation will be optimized to outperform any status quo operation. And, improved bottom line profitability and customer service levels along with more highly satisfied workforce will be yours to enjoy.